The Princess of African Foundation was established in 2006 to complement the work of Yvonne Chaka Chaka as UNICEF and Rollback Malaria Goodwill ambassadors in Africa. It is a non-profit organization registered under Section 21 of the Companies Act with main objectives being to carry out community and social charity works. Africa’s history. 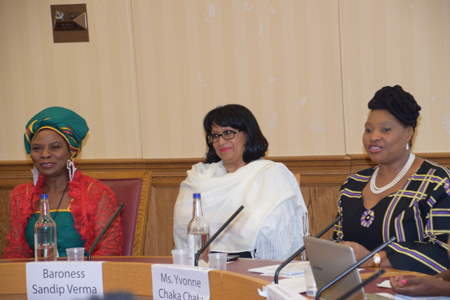 The Conference provided delegates an opportunity to gain insight and join discussions about the obligations, obstacles andopportunities for the Diaspora African Woman in Africa Rising. It is hoped that the Conference provided an avenue for understanding and paving a way for African women, including those in the Diaspora, to play an integral part in the rise of the continent in the wake of Africa’s changing political, environmental; economic and social landscape; and the United Nations Post-2015 Sustainable Development Agenda. "POWER 14" is a consortium of African Diaspora Women Leaders selected for their phenomenal leadership qualities and achievements in community development. The "POWER 14" are part of the top 100 Diaspora ChangeMakers Network, a project by the Royal Society of Arts with support from DfID's Common Grounds Initiative, Comic Relief and Unbound Philanthropy, that seeks to identify and bring together the UK’s most promising individuals of African origin with a desire to support African communities in the UK and Africa. The Universal Peace Federation (UPF) is a global network of individuals and organizations dedicated to building a world of peace centered on universal spiritual and moral values. It is an NGO in Special Consultative Status with the Economic and Social Council of the United Nations. It supports and promote the work of the United Nations and the achievement of the Millennium Development Goals, and advocates renewal of the United Nations, including a proposal that the United Nationscreate an interreligious council within its structures. UPF implements its programs through a global network of Ambassadors for Peace. In the evening there was a viewing of the documentary ‘The Motherland Tour: A Journey of African Women with Yvonne Chaka Chaka'. As one film review explains:'The Motherland Tour is a labour of love, with a special message from a woman who clearly loves her country, her continent and the people that struggle tremendously to live within it.' The documentary explains the work of The Princess of Africa foundation countering ignorance of malaria and highlighting treatment methods. The documentary also illustrates her work to promote education for women and the role of women to enhance development. This moving documentary starts with a quote: “The curious beauty of African music is that it uplifts even as it tells a sad tale. You may be poor, you may have only a ramshackle house, you may have lost your job, but that song gives you hope. – Nelson Mandela”. The Conference is organised by members of the “POWER 14” in association with the Universal Peace Federation. 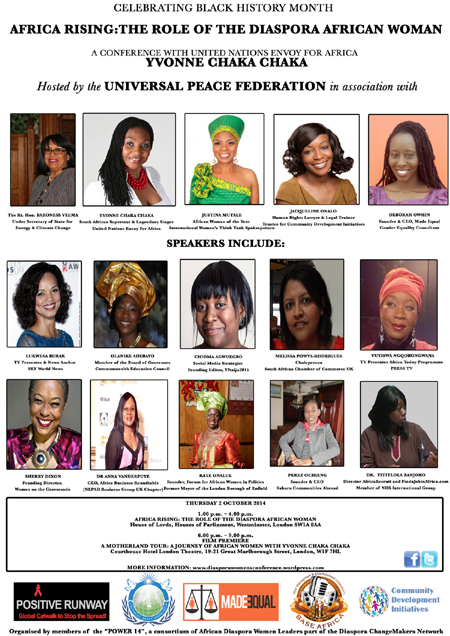 The “POWER 14″is a consortium of African Diaspora Women Leaders selected for their phenomenal leadership qualities and achievements in community development. The “POWER 14″ are part of the top 100 Diaspora ChangeMakers Network, a project by the Royal Society of Arts with support from DfID’s Common Grounds Initiative, Comic Relief and Unbound Philanthropy, that seeks to identify and bring together the UK’s most promising individuals of African origin with a desire to support African communities in the UK and Africa.